Some very common questions new patients have when they come in for their first appointment are “What are you looking for? How can you tell if I have varicose veins?” Ultrasound is excellent for diagnosing varicose veins and is used throughout the treatment plan. Patients can expect to have an ultrasound at all of their appointments. When the exam is started, the sonographer adjusts the bed to what’s referred as the Reverse Trendelenburg position, which is with the foot of the bed much lower than the head of the bed. This simulates standing, which increases venous pressure on the legs, and the blood flow patterns can be evaluated more accurately than laying down flat on a bed, which creates 0% hydrostatic pressure and the flow patterns would be minimalized. The patient does stand for part of the ultrasound when the back of the legs are being evaluated. 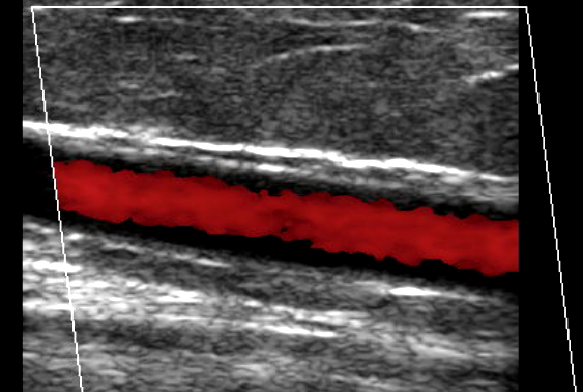 Reflux in a vein identified using color doppler. extremities, and the veins take the blood back to the heart. The amount of blood returning to the heart varies at any moment, as this is achieved by breathing. When there is increased abdominal pressure, for instance, taking a deep breath, the diaphragm presses down on the lower venous system, decreasing flow, just for a moment, and when breath is exhaled, the pressure is released from the lower venous system, and the blood rushes back to the heart. This happens over and over. There are valves throughout the veins, and when there is increased pressure on the veins, the valves will stop the blood from going back to the feet. When you have Chronic Venous Insufficiency Syndrome, the valves have stopped working and every time there is increased abdominal pressure, the valves won’t hold the blood where it is, and it all rushes towards the feet. 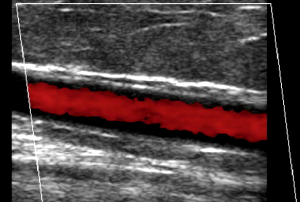 This phenomenon can be visualized on ultrasound by using Doppler, which can tell what direction the blood is flowing. The sonographer has the patient reproduce this through the Valsalva movement (bearing down) multiple times throughout the procedure. This is how venous disease is diagnosed. A week or so after the procedures another ultrasound is performed, this time to check for vein closure and to make sure there are no complications or blood clots. After several months the body has absorbed the vein and it is not visible on ultrasound anymore. Ultrasound is a very useful modality in the diagnosis of varicose veins and has revolutionized the treatment and management of Venous Insufficiency Syndrome.